As a child, you may have had this special moment at school. 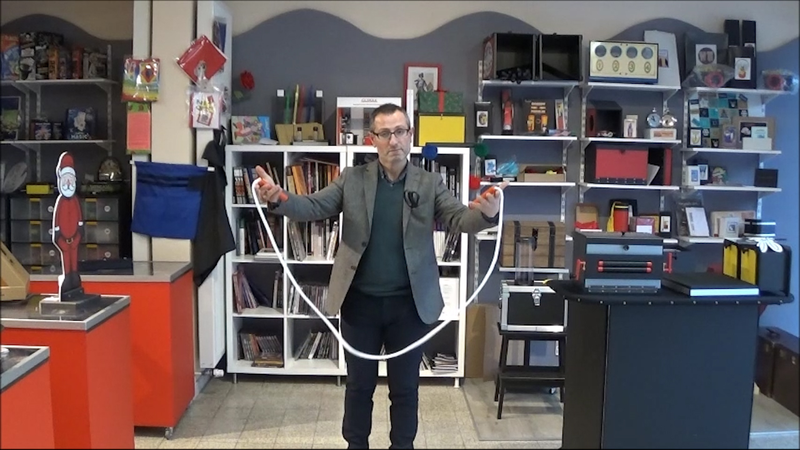 A classmate had pulled out a jumping rope during math class and the professor, angry, cut it in half! During your lunch break, a friend who pretended to be a magician, knotted the rope to continue playing. But the knot was misplaced! Without hesitating, she moved the knot along the rope, to the side: But it was still not right! So, she put it on the other side... but again, it was still not right! She repeated the operation again and again but there was nothing to do -- the knot was awkward! Then, with a magic word, she ordered the knot to fall off the rope. Magically, the rope was restored! You will receive the rope with which you can jump if you want. This rope is gimmicked, and you can achieve all these effects and much more. The explanations are on a video link - in French and in English.